What is a Dinosaur Egg? A Dinosaur Egg is a pluot. 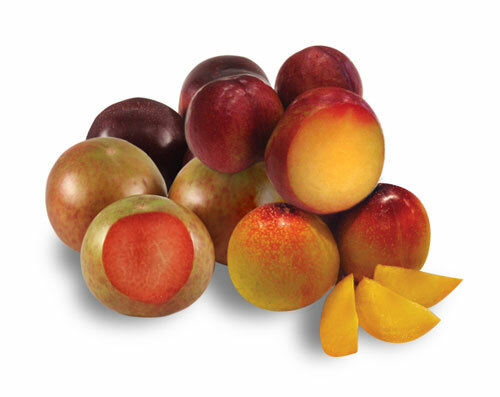 Pluots are a cross-pollination of plums and apricots resulting in a wide variety of colors, both inside and out, and unique flavors. Some pluots have more plum, some more apricot. 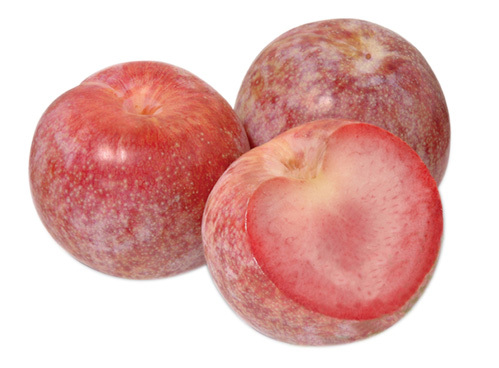 But all pluots are sweet and juicy, and some are also sweet and tart with tangy skins. Try them all to discover your favorites. Choose pluots that are firm. Store pluots at room temperature if you desire softer fruit. Refrigerate up to one week. Dinosaur Eggs are grown by the Jackson Family at Kingsburg Orchards in the heart of California's San Joaquin Valley. Mottled, dappled, or spotted pluots, like the unique Dinosaur Egg and Autumn Honey, start their season with green and purple spots, then turn to shades of pinks and purples with white spots. The inside flesh can range from dark magenta to creamy white with a pink blush. 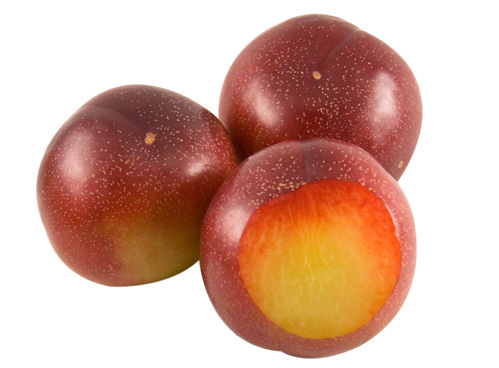 These pluots are all exceptionally sweet and juicy. Black skin varieties may include the Flavor Heart, Ebony Gold, and Black Pearl. These gems will have brilliant inside flesh colors of magenta and pale yellow. 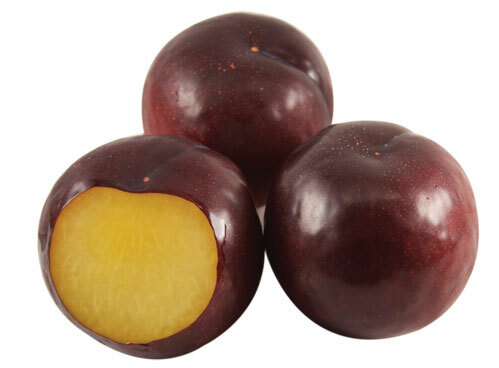 Black plums are the most plum-like in taste with a robust sweetness. Green skin varieties may include the Flavor Queen, Emerald Sweet, and Mango Tango. These varieties may be green with a red blush on the outside to turning completely yellow. The flesh inside may range from a pink blush to pale yellow. Green pluots are very juicy and sweet with a tropical flavor. Red skin varieties may include the Raspberry Jewel, Flavor King, Sugar Heart, Midnight Jewel, and Big Daddy. The outside color may range in red color with the inside going from dark reds to magenta. 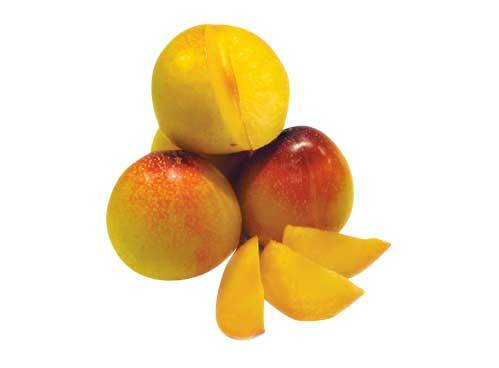 Some red pluots will have red rims fading into bright yellow. 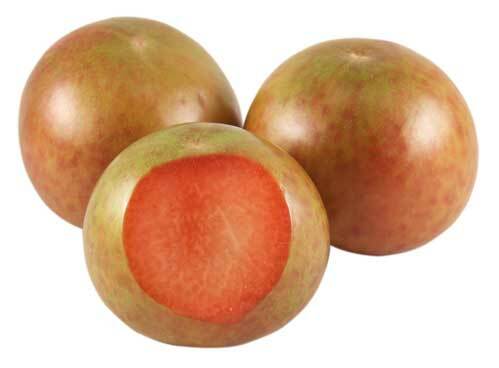 Red pluots have a bold and sometimes tangy sweetness. 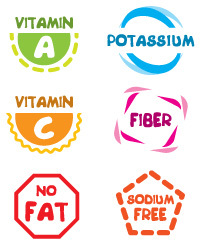 Pluots are good sources of vitamin A, vitamin C, potassium, and fiber. They contain no fat and are sodium free. Pluots also contain naturally occurring phytonutrients and antioxidants that are thought to play a key role in human health. 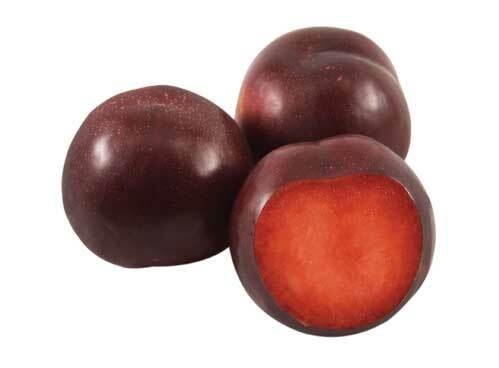 Red flesh plums, like our pluots, have been getting more attention lately. The reason for this is because of the recent studies that show how high the antioxidant levels are in red flesh plums. Compared to a handful of blueberries, our red flesh plums contain about the same amount of antioxidants, if not more. When people eat blueberries, they tend to eat just a few at a time, but when a person eats a plum they will eat the whole thing all at once and get the full benefit. 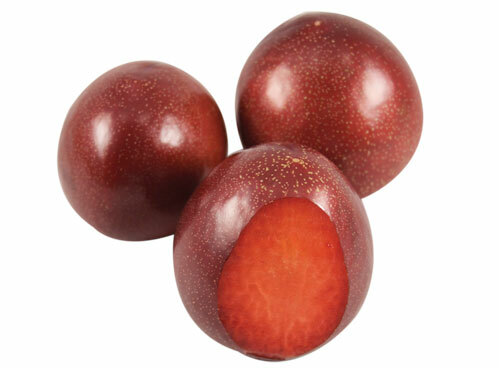 Along with antioxidants, our red flesh plums have phytonutrients which are associated with disease prevention. People should be eating at least five servings of fruits and vegetables a day and they need to make sure that plums are a part of that diet. 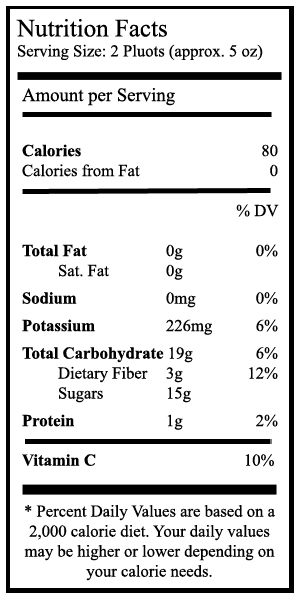 Click on the image to view the nutrition facts table for Pluots.